I am a big fan of my Veritas skew rabbet plane, I really am. For cutting consistent rabbets it is unsurpassed, and not once did it let me down when I was building my Anarchist’s Tool Chest last summer. It does have one flaw however; the locking collets which fix the fence in place rarely stay put under finger pressure alone, and using a wrench (which is essential if you don’t want the fence to shift mid rabbet) slowly chews up the brass collets. No one wants chewed nuts (stop sniggering at the back) do they? It is a minor grumble, but with a premium tool I feel I am allowed to grumble. All is not lost however, thanks to good friend, fellow Anarchist’s Tool Chest survivor, and awesome woodworker Bern Billsberry. As well as making larger pieces, Bern does a fine line in making dovetail markers (one of which he kindly gifted me last summer) and other shop appliances. A couple of weeks ago he featured a new tool on Instagram which quickly earned the hashtag “nut saver” (seriously, stop your sniggering!). This tool is specifically designed to tighten the collets on the Veritas plane sufficiently to avoid the fence slipping, but all the time avoiding chewing up the nuts. Bern was kind enough to send me a prototype nut saver, and I have been giving it a workout over the past couple of weeks. Essentially the nut saver is a loop of leather sandwiched within a hardwood handle, with the loop sized to tightly grip the collets on the plane. Look behind this simple appearance however and you will find there are some clever things going on. The version I received was made of bubinga to match the totes on the plane, and the handle has a lovely smooth feel, with no sharp arises. Bern has shown a real attention to detail with the two curves carved into the end of the handle which holds the leather loop. The radius on each of these curves matches that of the collets, and as you turn the handle of the nut saver, a curved edge engages with the collet (through the leather) and increases the torque available. Having curves on each half of the handle means that the handle operates equally well in both directions for tightening and loosening the nuts. 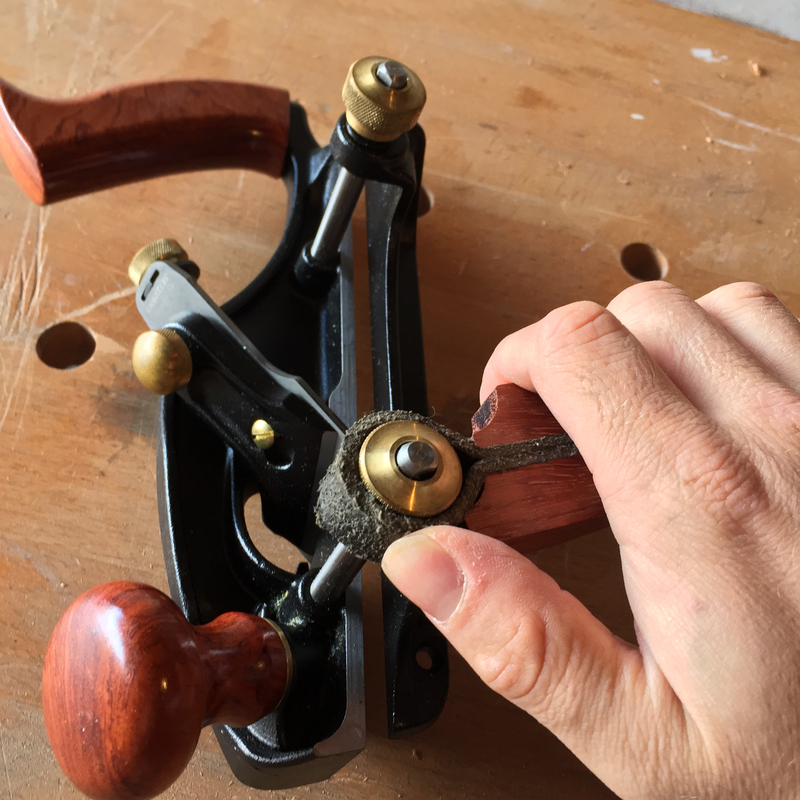 Over the past couple of weeks it has become second nature to reach for the nut saver when adjusting the fence on my rabbet plane, and the leather is much kinder to the collets than a wrench, while still offering plenty of torque. It is a shame that the depth stop nut is a different size to the fence collets, as the current nut saver does not fit the depth stop nut (which still needs to be tightened with a wrench). But this is a small complaint and not a failing of the nut saver. Bern recently did a “how to” tutorial on Instagram showing how he built the nut saver, but he is also taking orders for these. 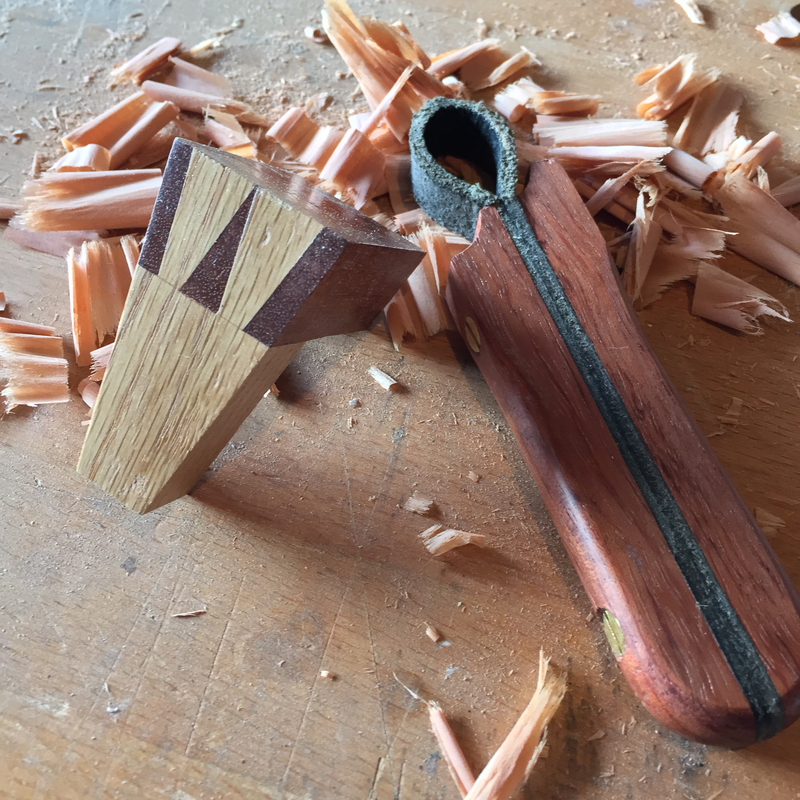 Given how effective this tool is, if you use a Veritas skew rabbet plane I would highly recommend dropping Bern a line (using his Instagram handle Berncarpenter) and buying a nut saver from him.